The US pushed its aggressive foreign policy towards Havana via the 1992 Cuban Democracy Act, which sought "a peaceful transition to democracy and a resumption of economic growth in Cuba" by mounting pressure on the Castro government via harsh sanctions and supporting his opponents. As Cuba entered into its Special Period of economic depression following the USSR's collapse, the US pushed neoliberal regime change through lawfare and ending any "remaining military or technical assistance, subsidies, or other forms of assistance" to Cuba from former Soviet allies. Robert Torricelli [D-NJ] tacked the bill to the 1993 National Defence Authorisation Act, which was given bicameral support and signed into law by former US president George HW Bush. The legislation also contained the Mack Amendment, written by US Sen. Connie Mack III [R-FL], a staunch opponent of the Castros. 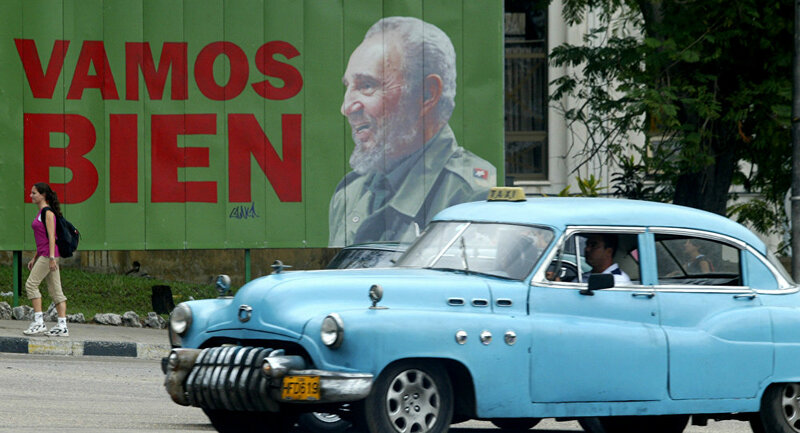 Further legislative actions against Cuba morphed into the 1996 Cuban Liberty and Democracy Solidarity Act (LIBERTAD). Any country attempting to circumvent US law would nullify eligibility for "assistance under the Foreign Assistance Act of 1961 or assistance or sales under the Arms Export Control Act", the bill stated, as well as "forgiveness or reduction of debt owed to the United States Government". The bill, however, contained provisions permitting "donations of food to nongovernmental organizations or individuals in Cuba" or "exports of medicines and medical supplies". The US administration vowed to "maintain sanctions on the Castro regime" if it refused to "move toward democratization and greater respect for human rights", according to the Mack Amendment. The Act also planned "a comprehensive United States policy toward Cuba in a post-Castro era", alluding to the overthrow of the Castros and installing a US-compliant government. The amendment was not well received by the FCO, with the Major Administration issuing the 1992 Protection of Trading Interests Act (PTIA) aimed at counteracting "hostile US extrajudicial territorial claims" opposing the interests of British subsidiaries of US companies operating in the UK. The PTIA order would force UK subsidiaries of US firms to not comply with US sanctions, with FCO officials calling the US laws "judicial hostage taking". Prior to enacting PTIA, the FCO asserted that maintaining trade with Cuba was considered "small political beer" compared with confrontations over sanctions against the USSR. Downing Street concluded in 1991 that any ‘supine' attitude towards interference by the US in legitimate export trade was to be opposed, as over $884mln (£700mn) in bilateral trade between US-owned British subsidiaries had already been affected from 1980 to 1990. There were also "no current problems, either of substance and timing" in issuing the Act, FCO private secretary Malcolm Butler said in a memo, as he surmised the "US administration is sympathetic to our position and is expecting such a response". The UK, Canada, and other Commonwealth nations intended to "block the act if it passes", assistant secretary David Melville said, noting that FCO officials predicted stronger "adverse reactions" if the UK abandoned "opposition to the amendment after having lobbied hard against it for years". "The Mack Amendment is so blatant in its application to UK-incorporated firms that our objections to measures of this kind would lose all credibility if we did not respond," Mr. Melville said. However, the bill's architect, US Sen. Connie Mack [R-FL], slammed his British counterparts, stating that the UK should comply with the unilateral law without protest. "Quite frankly, this is not a matter of economics," Sen. Mack replied. "It's a principle of freedom." Mack also urged the UK sever trade ties with Cuba in a "freedom-filled" tirade, citing a spike in third-party trade from $332mn to $705mn from 1980 to 1990. "That is a tremendous crutch to keep the Castros' tyranny alive", he ranted, adding that "free nations ought to help those seeking freedom". But British authorities were not convinced and responded in kind, stating that the bill was "extra-territorial" and proceeding with the PTIA, despite fears of a diplomatic row. Whilst acknowledging that the US had the right to prevent US-based companies from trading with Cuba, it was "another matter to extend the present ban on trade with Cuba to US subsidiaries incorporated in the UK and elsewhere overseas," former UK ambassador to the US Robin Renwick said. "If the British government similarly sought to curtail the activities of British subsidiaries incorporated in the United States, the US would take strong projection, and rightly so," Mr. Renwick said, noting that then-UK trade and industry secretary Peter Lilley would have no choice but to act with Canada intending to follow suit. In order to tackle the growing Cuban refugee crisis, US officials mulled changing the functions of its TCI Migrant Processing Centre, with then-US president Bill Clinton negotiating transfer of Cuban refugees to new "temporary safe havens" with the Panamanian government, a memo revealed. Panama approved the request to transfer 5,000-10,000 Cuban migrants to a "longer-term safe haven" on 20 August 1994 so that the State Department could remove "the need for a facility in the TCI" beyond mid-September, an FCO memo said. President Clinton changed his Cuban immigration strategy on 19 August after existing protocols "failed to stem the flow", the memo continued, adding that 1,189 and 1,293 had arrived on the following Saturday and Sunday, respectively. A US State Department official wanted to quickly secure a new memorandum of understanding "ad referendum" to stem the flow of migrants to Florida and other points of entry, the memo continued. The US government would also end "automatic asylum" to refugees at sea or on US territory, with migrants being detained at "temporary" safe havens to determine their status. The infamous Guantanamo detention centre was considered a ‘first option', but President Clinton opted to transfer them to "third countries" instead. British officials slammed the motion, warning that as the Turks and Caicos Islands were British territory, any immigration plans were subject to agreement from "Ministers in London" and others. The US would continue using Guantanamo because it was "all [they] had available", but was "far from ideal", the memo observed. The Castro government could easily flood Guantanamo with migrants and the TCI detention centre was better as the US marines had a 2,000-capacity camp there "which was standing empty".